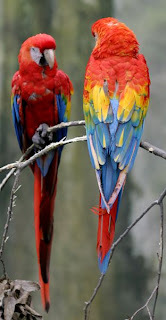 Scarlet Macaws are popular, but are a high maintenance pet; they are expensive to purchase, adopt, or maintain, they are demanding, and they are extremely loud and noisy cage birds. They are prized for their beautiful plumage and considered very affectionate with their owners. They are considered an intelligent species. They are very smart and sometime funny. If you don't ewant them to repeat anything you say, be mindful of what you say in front of them, they have no prejudice! The Papagayo wind is a north to northeasterly wind which periodically blows through the gap in the mountain ranges of Central America in which Lake Nicaragua is located. It is named for the Gulf of Papagayo on the Pacific coast in this region. The wind is stronger than the trade winds which normally blow here. It is notable for causing a pronounced increase in upwelling of cooler, nutrient-rich waters on the Pacific coast which in turn supports an abundance of sea life. The wind and upwelling are together referred to as a Papagayo event. El Papagayo is one of my creations of Hand Dyed yarn. Papagayo is the name we give in Spanish to the Scarlet Macaw. I tried to make the rainbow colors and somehow I succeeded,but some color bled into the others. I made a very long skein so that I can play with the colors a lot. The longer the skein the more opportunities you have to paint. The first picture below is the first skeining. I wanted to see how it would look like with the colors blended in full and thus the second skein came to life. I hope that I have inspired you to do some hand dye yarn. This hand dye job was done with Mc Cormick's Food coloring and White Vinegar and cooked in the microwave. In closing I will tell you that I would recommend everyone to try dyeing yarn with food coloring, it is a great experience and it will allow you to create something from within. Thanks for stopping by and remain in touch as I am going to reveal Square #4 from the Barbara G. Walker Learn to Knit Afghan sometime soon! I love the colours of the yarn! Nice work with the food colouring!